What, where and when is the Chinese New Year. The dragon of the Chinese New Year. 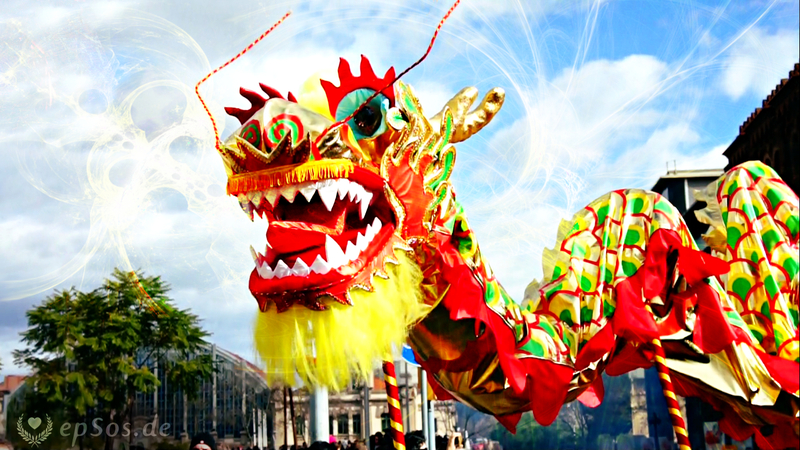 The Chinese new year is celebrated in countries with significant Chinese populations. It is one of the world's most important festivals, with the the largest movement of people in the world. According to the legends, the beginning of the Chinese new year started with a mythical story from the past. The dragon would eat old villagers, and small children. One year, all the villagers decided to hide from the dragon. One old man said that he was not afraid. He went into hiding and said that he's going to stay awake in the night. He decided to get revenge on the dragon. All the villagers thought that he was insane. The old man put red papers on his door and set off firecrackers. The day after, the villagers came back to their town, to see that nothing was destroyed. They assumed that the old man was a deity who came to save them. The villagers then understood that the Chinese dragon was afraid of the red color and loud noises. When the Chinese new year was about to come, the villagers would wear red clothes, hang red lanterns, and red scrolls on windows and doors. People also used firecrackers to frighten away the Chinese dragon. From then on, the dragon never came to the village again. On the days before the Chinese new year, the Chinese families clean their homes and prepare food. It is believed that the cleaning removes away the bad luck of the preceding year, and makes their homes ready for the good luck of the new year. Some people renovate their homes, doors and windows with a new layer of red paint. Purchasing new clothing and shoes also symbolize a new start. The Chinese new year is a very good festival for the Chinese restaurants and shops, because people spend money that they earned in the old year. The Chinese businesses are expected to pay off all the debts before the new year. It is a common practice to send gifts and rice to close business associates, and extended family members. The biggest event of any Chinese New Year is the New Year's Eve with it's annual family reunion dinner. In northern China, it is common to eat dumplings around midnight. Dumplings symbolize wealth. After the dinner, some Chinese families go to the local temples, before the new year begins. Many modern people organize private parties with music, food, drinks and a countdown for the Chinese new year. The Chinese people normally return to work by the eighth day of the festival, where the business owners will provide a free lunch for their employees. For the work they have done in the whole year. Some people hold a ritual prayer after midnight, on the eighth day of the festival. Money is very important during the Chinese new year. Almost all Chinese people give money to each-other during the Chinese new year. The red envelopes with money are usually given from older people to the younger people. Small gifts, food or sweets are also exchanged between friends and relatives. The Chinese markets are part of the tradition. The Chinese markets sell decoration, red envelopes, small gifts, sweet desserts, toys for children, the fireworks, religious items and many tasty versions of the Chinese food. The desserts are very popular for the people who want to buy gifts for their friends. Clothing with red or bright colors is commonly worn during the Chinese new year, because it was once believed that the red could scare away evil spirits and bad fortune. In addition, the people wear new clothes that symbolize a new beginning in the new year. Wearing new clothes also symbolizes wealth. Red is the color of good luck during the Chinese new year. In some families, the photographing of the family portrait is an important ceremony. The photo is taken at the hall of the house, or taken in front of the house. The most senior member of the family sits in the center. The Chinese new year is the most important festival for the Chinese people. This festival is celebrated in all parts of the world, where the Chinese people live. The celebration of the festival is connected to the lunar calender, and the astronomy. The Chinese new year is the longest holiday for the Chinese people. During this festival, the family and the good friends visit each-other. There are many different events and traditions during the festival of the Chinese new year. In this wonderful video we can see the celebration of the Chinese new year in Barcelona. The Chinese new year is connected to the ancient knowledge about the astronomy. The Chinese new year is the celebration of the new year on the moon. The calender of the moon is different from the calender of the earth. The date of the festival is different every year, because there is a difference in the two calenders of the moon and the earth. The most common celebration of the Chinese new year is in the last week of the January and the first week of February. The Chinese people have many traditions that are connected to the old knowledge about the astronomy and the galaxy. Some Chinese women do believe in the strong power of the stars, and that our life is connected to the position of the large plants in the cosmos. The Chinese calender has 12 different years. Each year has a different atmosphere and the different energy. This system is written in the rules of the zodiac. The rules of the zodiac do create a system for understanding the world. The modern Chinese women do not believe into the rules of the zodiac, but they like the old traditions, because they are interesting and sometimes funny. The festival of the Chinese new year is the time for the publication of the horoscope, for the new lunar year. The horoscope is trying to provide the prediction and suggestions about the future. Most of the Chinese women do not follow the prediction and the rules of the horoscope. The entertainment is the main goal of the horoscope. It is not possible to make good predictions about the future, but it is possible to set the mood and the atmosphere of the mind. The Chinese horoscope can create the vision, and the mood in the mind. This vision can become real, if we believe into the predictions of the horoscope. Some of the predictions can become true, and we start to believe into the horoscope even more. Most Chinese women just read the horoscope, because it is funny. The different parts of the world have their different culture and festivals. The Chinese new year is like the Christmas time for the Chinese people. The Indian people have their festival of colors. The Arab people have their festival of fasting and praying. The Chinese new year is very important in the Asian part of the world. Many Asian people plan their vacation during this time of the year, because most Chinese people have two weeks of vacation for the celebration of the Chinese new year. The industrial economy stops for 2 weeks, and the people take time to celebrate the new year. The Chinese new year is the best time for the Chinese restaurants, because the people buy a lot of Chinese food during this time. The Chinese new year is the best time for visiting China, Hong Kong and Singapore, where we can see the large celebration of the Chinese new year. There is a large Chinese community in Barcelona. The Chinese people organize the festival of the Chinese new year in Barcelona. Many Chinese schools and organizations participate in the celebration of the festival. The government of Barcelona does officially support this festival. The police and the city help to organize the festival. Every year, the Chinese new year is growing larger and larger in Barcelona. The Chinese community is growing and there are many Chinese children who are born in Barcelona. The festival is the best time for the children, because the older Chinese people must give presents to the younger people in the Chinese culture. The Chinese children are very happy about this tradition. We can be very happy that the Chinese new year is part of our colorful world.